As of Joomla 3.9, Joomla introduced a privacy tool suite in response to laws and regulations such as GDPR. In this tutorial, you will find information on how to set up these new extensions. The privacy dashboard provides a summary of the information requests for the website and a status of recommended actions to take. The Privacy Dashboard is located under the Menu link 'Users" in the admin panel. The request count "module" is a summary of the information requests on a website, this is similar to the privacy dashboard module explained below. Check if the information request form has a published menu item - This will determine if the frontend information request form has a published menu item to help authenticated users submit valid requests. Regardless of a menu item being published, a valid URL for the request form is always displayed. Check if there are any urgent requests - This will check for confirmed requests older than the age specified in the component parameters (default 14 days) and alert the site owner of any requests requiring urgent attention. Check if mail sending is enabled - To process information requests, the site must be able to send email. With mail sending disabled, information requests cannot be created or actioned. This screen is the central location for processing and managing user information requests. More information about this screen and the workflow for information requests can be found on the Information Request Workflow in Privacy Component page. the user has actively consented to your usage of the data. This plugin does NOT make your web site legally compliant, it is just a step in the process. 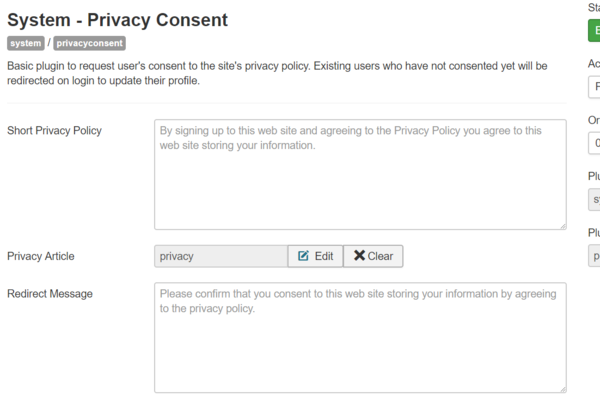 Once the plugin has been enabled then any new user registering on your site will be required to consent to the Privacy conditions. The date and IP address of the user will be recorded. All existing users will be redirected to their User Profile so that they can consent. The plugin is installed but not enabled by default with Joomla 3.9 - to enable it go to Extensions → Plugins and search for Privacy. Once you have located the plugin you can enable it and configure the settings. This is a brief notice that will appear above the Privacy Consent checkbox. You can leave it as it is and the displayed message will be used or you can enter your own custom text. Note for Multilingual sites. If you use the default text then it will be displayed in the user's language. It is not possible to translate the custom text. If you wish to customise the text and display it in multiple languages then you should leave this field blank and use the Joomla language override facility to customise the PLG_SYSTEM_PRIVACYCONSENT_NOTE_FIELD_DEFAULT language string for each language installed. This is the message that is displayed to existing users when they login for the first time since the Privacy Consent plugin was enabled on the site. You can leave it as it is and the displayed message will be used or you can enter your own custom text. Note for Multilingual sites. If you use the default text then it will be displayed in the user's language. It is not possible to translate the custom text. If you wish to customise the text and display it in multiple languages then you should leave this field blank and use the Joomla language override facility to customise the PLG_SYSTEM_PRIVACYCONSENT_REDIRECT_MESSAGE_DEFAULT language string for each language installed. Note for Multilingual sites. If you use the default text then it will be displayed in the user's language. It is not possible to translate the custom text. If you wish to customise the text and display it in multiple languages then you should leave this field blank and use the Joomla language override facility to customise the PLG_USER_TERMS_NOTE_FIELD_DEFAULT language string for each language installed. If you wish to have a longer Terms & Conditions you can create/edit the article here which will be displayed in a modal window. Note for Multilingual sites: If you associate this article with alternatives in other languages then the Terms & Conditions will be displayed in the correct language for the user. 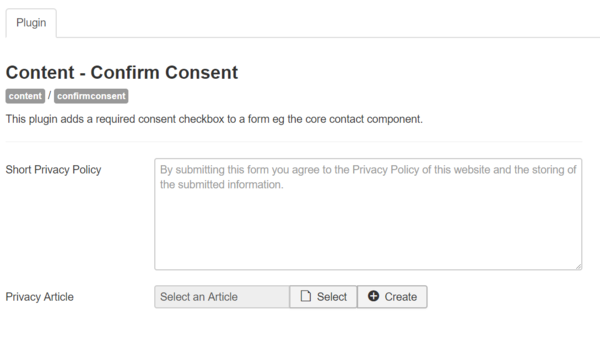 This plugin will add a required checkbox to a form eg the core contact form. The plugin is installed but not enabled by default with Joomla 3.9 - to enable it go to Extensions → Plugins and search for Consent. Once you have located the plugin you can enable it and configure the settings. Note for Multilingual sites: If you use the default text then it will be displayed in the user's language. It is not possible to translate the custom text. If you wish to customise the text and display it in multiple languages then you should leave this field blank and use the Joomla language override facility to customise the PLG_CONTENT_CONFIRMCONSENT_FIELD_NOTE_DEFAULT language string for each language installed. This module provides a summary of the information requests received for your website. The module is installed and enabled by default with a new Joomla 3.9 installation. To add it to your dashboard on an updated site, go to Extensions → Modules, change the Site filter to Administrator, add a new Privacy Dashboard module, assign it to the cpanel position, and set access to Super Users. This page was last modified on 2 November 2018, at 08:58.